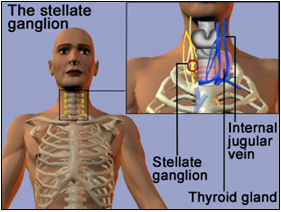 Stellate ganglion blocks are used to treat pain in the upper body that is a result of damage to the stellate ganglion. A network of nerves known as the sympathetic chain, originating in the spinal cord and running along it down the trunk of the body, are an important feature of the nervous system. These nerves branch out from the spine to control a number of both conscious and unconscious (e.g. heart rate) processes in the body. Ganglia (singular; ganglion) are nexuses, or clusters, of nerve endings. The sympathetic system comprises many important ganglia. A chain of these nexus points control movement and sensation and are located parallel to or within the spinal cord. The stellate ganglion controls blood supply and sensory processing to the head, chest, and upper extremities. Damage to this ganglion, through irritation or injury, can agitate the nerve impulses to and from the arms, hands, fingers, face, or upper chest. This can cause pain in these regions. Stellate ganglion damage is not treated effectively with conventional oral medications, such as opioid painkillers. An alternative to these are injections administered to the stellate ganglion to antagonize (or block) pain signals associated with the nerve cluster. These procedures deliver anesthetic medications into the stellate ganglion. Stellate ganglion blocks are effective in treating conditions that involve chronic pain to the areas served by them. Stellate ganglion blocks are injections given at the stellate ganglion in patients diagnosed with a relevant condition and evaluated as a candidate in whom a block will be safe and effective. First, a local skin anesthetic is administered to numb the area of the neck above the ganglion. 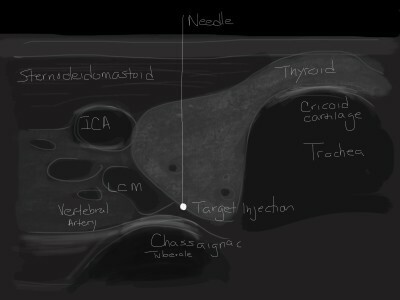 Then another needle is inserted in the region of the nerve cluster. The injection site is located using techniques such as ultrasound or fluoroscopy to ensure accurate needle placement. Next, a pain-blocking or anesthetic compound is injected. This blocks the pain-conducting signals that come from injured or irritated nerve endings in the ganglion. Alternatively, a catheter can be inserted into the site, which will deliver the anesthetic over some hours, to treat severe and/or chronic pain. Stellate ganglion blocks can also be used to diagnose conditions associated with the nerve cluster. This procedure is a minimally invasive treatment for chronic pain or other negative effects of nerve damage. 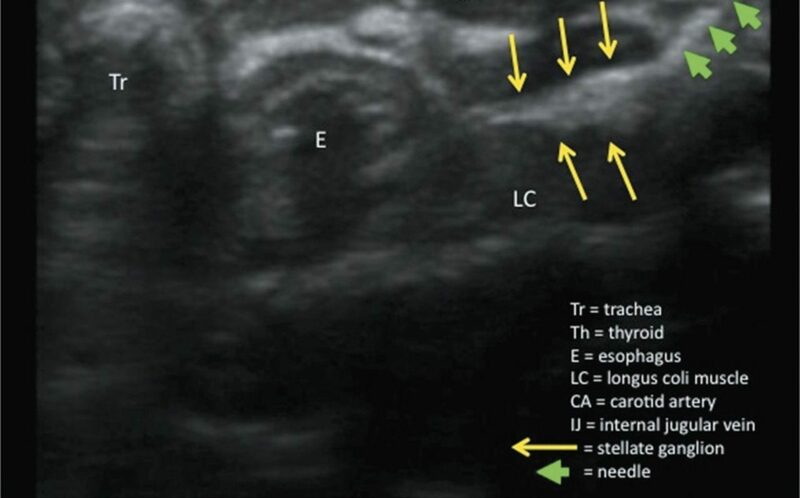 Complications of the stellate ganglion block mostly arise from its close proximity to the esophagus (the tube connecting the mouth to the stomach) and the vertebral artery. Accidental injection into either of these can have severe effects, such as chest discomfort, difficulty swallowing, aneurysm, and bleeding. The use of fluoroscopy, or a similar technique, should reduce these errors to a minimum. Other rare side effects associated with stellate ganglion block injections are vocal cord paralysis, a numb sensation in the chest, nerve damage, and respiratory problems. More common, temporary and mild effects, such as drooping eyelids and nasal congestion, may occur as a result of stellate ganglion block. The stellate ganglion is a nexus of a certain number of cervical and thoracic nerve endings. Therefore, conditions affecting the face, arms, hands, and chest can be associated with it. Patients with complex regional pain syndrome, a condition with an uncertain or multiple sources of origin, including nerve damage and a disproportionate pain reaction to injury in the arms or hands, benefit from this procedure. Headache and chronic facial pain associated with the sympathetic system is also treated by stellate ganglion blocks. Patients with angina (chest pain) may also consider this option. The block also shows potential in treating other, non-pain related conditions. Hot flashes, which are associated with menopause and also some breast cancer treatments, were shown to be reduced by administration of stellate ganglion blocks. Stellate ganglion blocks have also demonstrated success in treating the symptoms of post-traumatic stress disorder. Electrical storm syndrome, a result of blockage in the arteries of the heart that causes persistent irregular heartbeat, also responds to stellate ganglion block. The stellate ganglion provides sympathetic nervous control to the upper limbs, facial areas, and chest. This is a cluster of nerve endings that can cause a range of painful and serious conditions if damaged or malfunctioning. 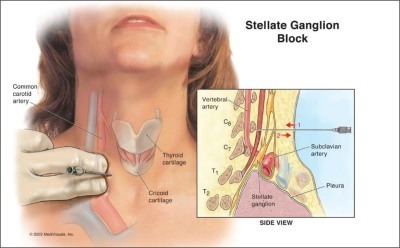 Stellate ganglion blocks are common procedures in which the cluster is injected with anesthetic medications to prevent the abnormal signals causing pain or disease. This simple and quick intervention treats a range of chronic pain types, and other disorders. Some rare side effects associated with this procedure are bleeding, vocal cord paralysis, damage to the esophagus or vertebral artery, and chest discomfort. Stellate ganglion blocks are a relatively safe, non-invasive, and effective pain treatment. Toshniwal G, Sunder R, Thomas R, Dureja GP. Management of complex regional pain syndrome type I in upper extremity-evaluation of continuous stellate ganglion block and continuous infraclavicular brachial plexus block: a pilot study. Pain medicine (Malden, Mass.). 2012;13(1):96-106. Gadhinglajkar S, Sreedhar R, Unnikrishnan M, Namboodiri N. Electrical storm: Role of stellate ganglion blockade and anesthetic implications of left cardiac sympathetic denervation. Indian journal of anaesthesia. 2013;57(4):397-400. Shanthanna H. Utility of stellate ganglion block in atypical facial pain: a case report and consideration of its possible mechanisms. Case reports in medicine. 2013;2013:293826. Lipov EG, Navaie M, Brown PR, Hickey AH, Stedje-Larsen ET, McLay RN. Stellate ganglion block improves refractory post-traumatic stress disorder and associated memory dysfunction: a case report and systematic literature review. Military medicine. 2013;178(2):e260-264. Noma N, Kamo H, Nakaya Y, et al. Stellate ganglion block as an early intervention in sympathetically maintained headache and orofacial pain caused by temporal arteritis. Pain medicine (Malden, Mass.). 2013;14(3):392-397. Bhatia A, Flamer D, Peng PW. Evaluation of sonoanatomy relevant to performing stellate ganglion blocks using anterior and lateral simulated approaches: an observational study. Canadian journal of anaesthesia = Journal canadien d’anesthesie. 2012;59(11):1040-1047. Narouze S, Vydyanathan A, Patel N. Ultrasound-guided stellate ganglion block successfully prevented esophageal puncture. Pain physician. 2007;10(6):747-752.